Statistical Studies of Historical Social Structure articulates and applies concepts from statistics into historical investigations of pre-industrial English households. 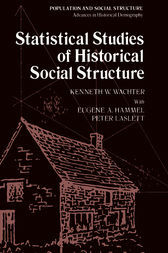 The book provides statistical reports on household composition and demographic influences and uses simulation in the study of problems in historical structure. Chapters are devoted to computer simulation experiments; presentation and analysis of English household composition data; correlation of English patriline extinction with social mobility; and how age distribution affects English social structure. Statisticians, historians, demographers, researchers, and students will find the book interesting.